researcher centers. RCP & RIPS have maintained extraordinary track record in the past university exams. The focus is on making RCPians and RIPSians a world class professionals. Madhya Pradesh has entered the era of high-tech industries such as Pharmaceutical, Electronics, Telecommunications, etc.. A large number of Pharmaceutical industries have been established at Pithampur,Dewas, Mandideep near Indore& Bhopal. 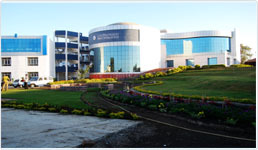 Prominent industries in the public sector in the state are located at Bhopal, Various agro-pharmaceutical project are running for increasing infrastructure of State.Ranbaxy Pvt.Ltd has extended its firm in dewas in R&D of Medicines The technical education scenario of the state can be rated as excellent. Keeping in mind the growing needs of technocrats in the pharmacy field, Radharaman College of Pharmacy has introduced M. Pharm (2 Year P.G. course) in pharmacology in year 2008 with intake of 10 students. This year we are looking forward to start P.G. course in pharmaceutics and pharmaceutical chemistry. The college has experienced teaching faculty, three professors with Ph.D degree and three more faculty members are carrying out their Ph. D from the institute. In this institute we have established a well designed animal house compiling all regulatory requirement of Committee for Control and Supervision of Experiments on Animals (CPCSEA). This animal house is licensed and registered with (CPCSEA) to carry out breeding and experiments on animals. In our central instrumentation laboratory we have UV spectrophotometer and Brookfield viscometer with latest specification. We have placed order for HPLC form shimadju (Japan). We have designed well furnished and well designed laboratories to carry out practicals. We also have separate class room and laboratories for P.G. course. We also have well established library with of books, , periodicals and various national and international journals. Keeping in mind all those features Radharaman College of Pharmacy well deserve the new addition of P.G. courses which will be beneficial to the appearing students to gain knowledge and expertise in pharmacy education.